On our honeymoon, my brand-new husband and I crossed the threshold of Domenica’s in New Orleans at around 5:00 p.m. To our surprise there was already a 3 hour wait for walk-ins. So, reservation-less and with the subtle glow of fainting newlyweds, we began stalking the tiny bar, which was tucked away in the corner of the restaurant. After a few moments of pathetic low-blood sugar stares, we finally nabbed 2 seats at the bar. Shameless success. We made it clear we were here for the pizza as Domenica boasted some of the best in town. We ordered 2 full-sized pizzas, one with meat for the carnivorous male and one white pizza for myself. I felt content with our selection until I saw something roaming around the restaurant that caught my eye. From a distance, the dish looked like a large, charred, textured…ball? As the plate got closer and closer I realized it was cauliflower. Cauliflower. 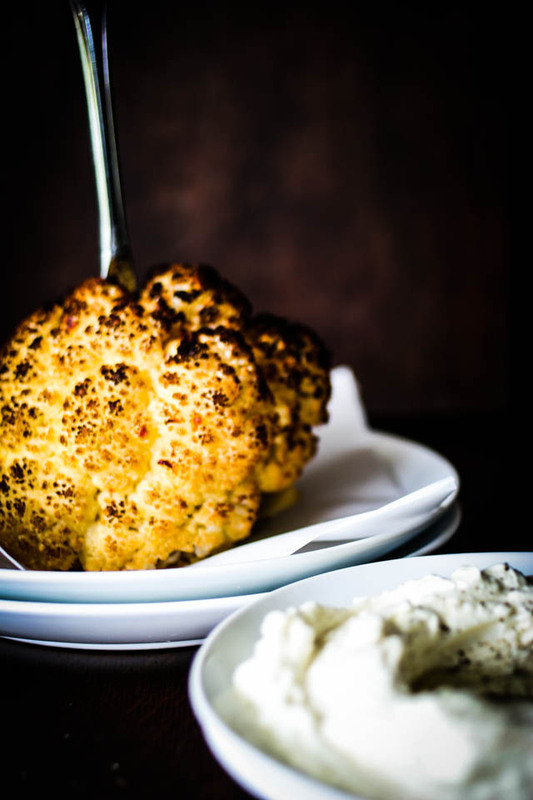 Whole roasted cauliflower served with a creamy spread, puddled with rich, fruity olive oil. The fair head is poached in a lovely, bubbling bath of white wine, lemon juice, olive oil and butter, stained and roasted in an 800-degree wood-burning oven. 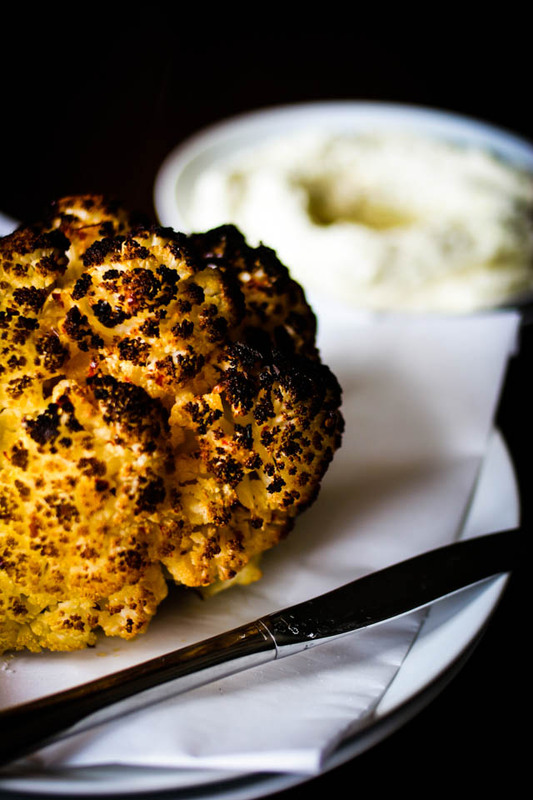 The whole head of cauliflower arrives dramatically at the table; singed with a Laguiole steak knife strategically plunged into its head, exposing a hint of winter white under the bronzed florets. Domenica’s pizzas were outstanding, but it was this unusual, dramatic appetizer that grabbed my attention and did not dare let go. As we were about to walk back onto the streets of New Orleans, bellies full and spirits (and blood sugar) high, I turned and looked at the restaurant and spotted many a cauliflower heads and smiled. New Orleans knows how to feed its people and anyone else that walks across the city’s threshold. Note: Whenever prepping the cauliflower head, pull back and discard the leaves and trim the core so that the whole head will sit flat on the roasting pan. Also, if you don’t care for the taste of wine, you can omit it; just add 2 ½ cups more water to the poaching liquid. Bring wine (if using), oil, kosher salt, lemon juice, butter, red pepper flakes, sugar and 8 cups of water to a boil in a large pot. Add cauliflower, reduce heat to a simmer, turning occasionally, until a knife easily inserts into the center, about 15-20 minutes. Using a mesh spider, drain the cauliflower well and transfer cauliflower to a rimmed baking sheet (make sure there is very little liquid remaining in the cauliflower or else smoke could pour out of your oven and make your smoke alarm go off and your neighbors would very much dislike you.) Roast, rotating sheet halfway through until browned all over, 30-40 minutes. While the cauliflower is roasting, blend goat cheese, cream cheese, feta, cream, and 2 tablespoons oil in a food processor or blender until smooth, season with sea salt and black pepper to taste. Transfer whipped goat cheese to a serving bowl and drizzle with oil. Transfer cauliflower to a plate. Drizzle with oil, sprinkle with salt. Place a steak knife in the middle of the roasted head of cauliflower. Serve with whipped goat cheese. I’m headed to New Orleans this weekend with my husband and some friends, and we are planning a dinner at Domenica! So glad to hear about this app – will definitely be trying!!! Yes, it’s a MUST! Any of the pizzas were spectacular as well! I eat at Domenica on a regular basis and I love just about everything on the menu, but this cauliflower…it was a revelation the first time I had it. One of my favorites! I’m a little envious that you get to eat at one of my favorite New Orleans spots on a regular basis! I went to Luke (another John Best restaurant) when I was in NOLA a few months back. It was amazing. I would love to try Domenica next time I’m there. I’ve been intrigued by that cauliflower since I saw it in Bon Appetit. Yours is lovely. Oh it’s incredible! I love Bon Appetit , and whenever I saw they had the recipe for the whole roasted cauliflower, I knew I needed to make it ASAP! Heck, it looks so great, I’d make it today if it wasn’t already sweltering in my house this morning. I refuse to turn on the AC (in Michigan) in May. I’m just not going to do it. Thus, no oven. haha. True! If only we all had outdoor wood burning ovens! That would solve the trick! It’s going on my wish list! That sounds amazing. I’ve never tried cauliflower with goats cheese but I just know I would love it. But a whole cauliflower as an appetizer? Is that just for one person and they expect you to eat something else after? It’s supposed to serve 6 as an appetizer but I wouldn’t share! Yikes!